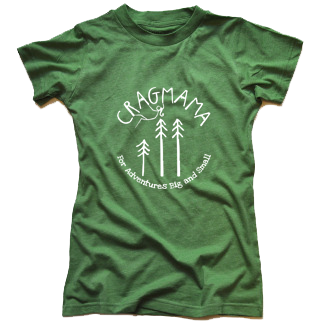 Crag-Family Interview: A Family Affair! Family climbing trips are about far more than just climbing! Rob: Constructing a home bouldering wall which has provided many hours of family fun as we take turns on boulder problems and cheer each other on. Jen: The fact that I can continue to enjoy climbing in my own way and at my own pace, after so many years being married to one climbing fanatic and raising more! Sam: I like bouldery climbs and triumphed on “Little Teapot” (12a) on the very last day of our 2010 trip to the Red River Gorge. I was twelve at the time, and it took me about five tries. Harry: I took a nasty fall when I was 8 that flipped me upside down and freaked me out. Getting back on that climb was one of the hardest things I’ve ever done. Preston: About two years ago, I decided to try to break my brother’s endurance record. He had climbed 25 jug laps on our home wall without stopping. I climbed until I got blisters on my hands but kept going. Then the blisters popped but I still didn’t give up. With my family cheering me on, I completed 26 jug laps and was king! I never worked harder in my life. 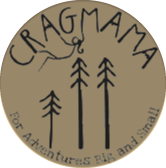 How did you manage the logistics of everyday craggin’ during the kids’ early years? 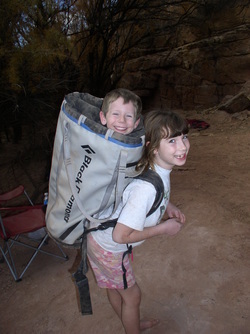 Rob: When we could, we climbed at family-friendly, easy access areas such as Penitente Canyon, Colorado and Mentmore, New Mexico, where you could literally push a baby stroller up to the crags. Frequently, we’d be at less convenient areas where we would make difficult car to cliff hikes, fully loaded with gear and kid supplies. We wanted our kids to grow up loving the outdoors, not just being the victims of their parents’ interest in rock climbing. We worked hard to help them be happy. We built lots of forts out of sticks, went on little nature hikes, set up super-easy TRs, let them leap off of boulders into our arms, and set up lots of rope swings. During those days, I had to lower my expectations for personal achievement. If everything worked out just right so that the kids were happy and settled and the conditions decent for a bona fide redpoint run or two, I was lucky. Jen: Rob is the reason we were able to keep climbing with our young kids. He was willing to haul extra stuff and run back to the car for things we forgot. I remember days when Rob would have a haul bag on his back with Harry sitting on top of the haul bag. Rob would be carrying the pack-n-play in one hand and holding Sam’s hand with the other. I would have been carrying Preston in a toddler backpack with a rope bag slung across my chest. Those were quite the days. What was the biggest challenge when your kids were little? Rob: I think the biggest challenge was overcoming that psychological notion that climbing outdoors with little children was absurd. Jen: More challenging than the logistics for me was the feeling that other climbers were bothered by us bringing our kids to the crag. I would feel horribly embarrassed if our kids were crying or playing too loudly. There’s an unwritten rule about not disturbing other climbers’ peace. Whenever I see parents with young kids at the cliff, I always try to let them know I’m not bothered by their kids. 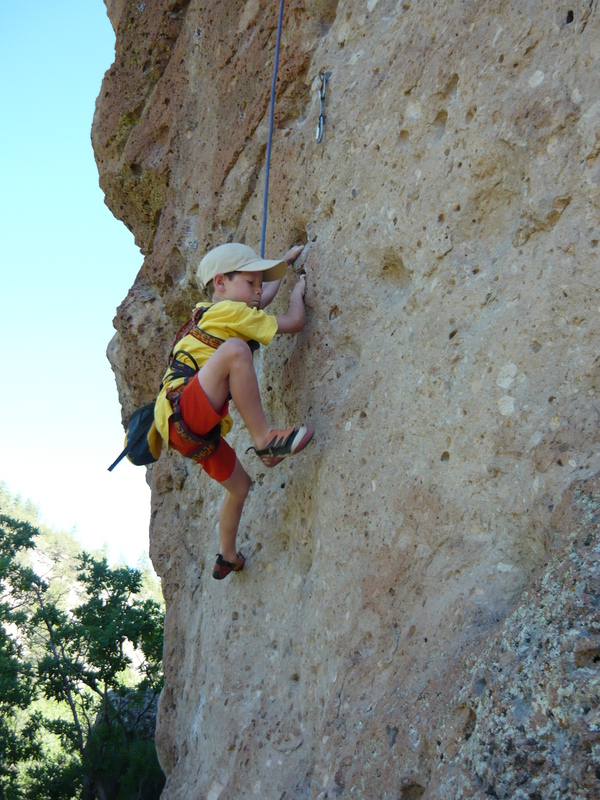 At what age did your children start showing an interest in climbing? Rob: Harry started climbing before he could walk and we had to keep an eye on him so he wouldn’t climb into dangerous situations. Once, I left an aluminum ladder leaning against a shed which I was roofing. I went into the house for a moment and when I returned outside to the shed, Harry was at the top of the ladder, which was horrifying. 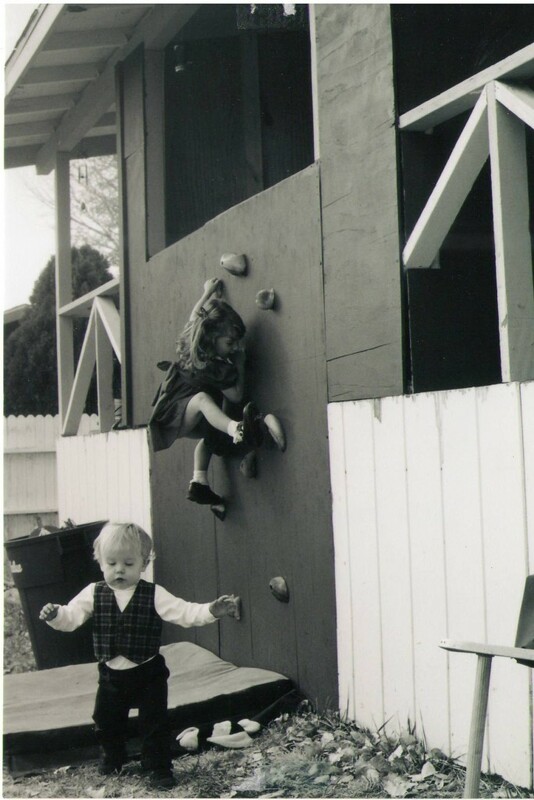 When Sam was about 3 years old, I built a 6’ high vertical wall splattered with jugs as a means for her to enter a playhouse on top of our back porch and she quickly developed a preference for climbing into her playhouse as opposed to walking in through the door. Preston started young, too, and seemed to gravitate towards climbing trees. All the kids started monkeying around on home walls at early ages. Jen: Each was in the 8-10 year-old age range when they began to figure out their individual relationship to the sport and how much energy they wanted to put into it. How did you balance finding routes for everyone to enjoy and be challenged with (especially when your kids were younger and just getting into climbing)? Rob: At first we visited areas where easy climbs were close to harder climbs…but over time this really cool transition took place – it became much interesting, important, and satisfying to focus outdoor excursions on climbs for the kids. I think their ages, interests and abilities had a lot to do with the timing, but the transition seemed natural when it occurred. For example, I don’t think it would have been necessary for Jen and I to relinquish our own objectives to set up topropes for toddlers all day long. But by the time we had a 12 year old who was interested, a 9 year old who was gung-ho, and a 6 year old who was motivated, it was time to make their objectives top priority. Jen: In the early going, the kids would climb our warm-ups and then they’d be content playing while we climbed. Now, Rob and I have to sacrifice our agenda most of the time (in everything, not just climbing!) Much of the time we don’t get to climb precisely what we would choose to, and that’s okay. We have learned that what we really want is to raise these children as best we can – it’s far more rewarding that we could have imagined! 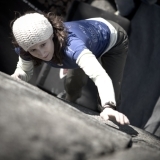 Did your attitude towards risk in climbing change after becoming parents? Rob: Our main concerns have been about the kids’ safety rather than our own. 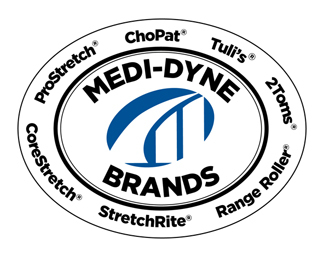 Obviously, you can’t eliminate all risk from an inherently dangerous sport, but your can be vigilant about checking knots, harnesses, ropes, and fixed draws. The scariest experience I ever had with Sam and Harry occurred when they were 5 and 2 years old. 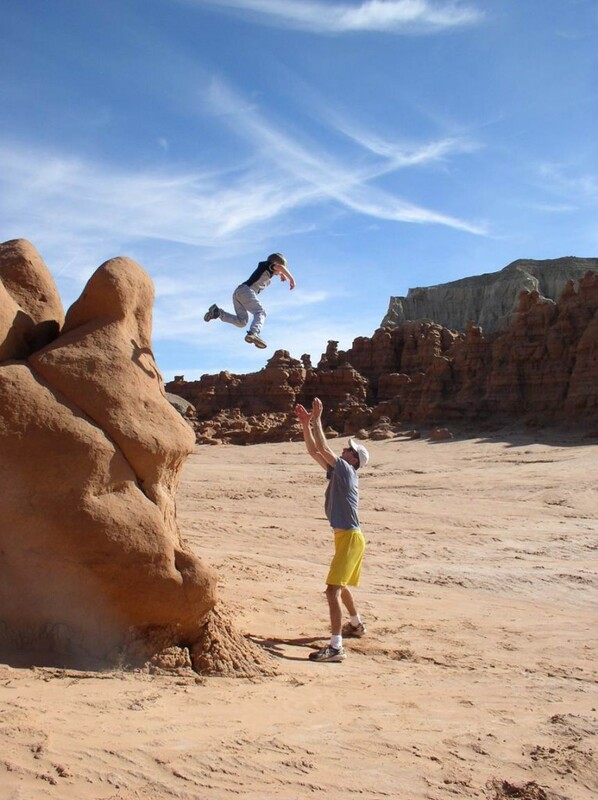 We were bouldering in the desert on super-easy kid stuff, which they were loving. At one point, I had them both sit down on a little rock so I could check a boulder just beyond a fence. Just before I hopped over, I heard them both screaming, and I whirled around to see a coiled rattlesnake inches from their feet. I don’t know how I’d failed to see it when I told them to sit there – we experienced a little miracle that day! Jen: I’ve had to grapple with the fear of children falling and getting hurt. For a time, I couldn’t watch my kids lead. I’d imagine all sorts of stuff like a bolt failing or a rope getting severed or a knot coming undone. Over time, I’ve come to the conclusion that all living involves risk. I know that kids get hurt way more often and more seriously riding ATV’s than rock climbing. 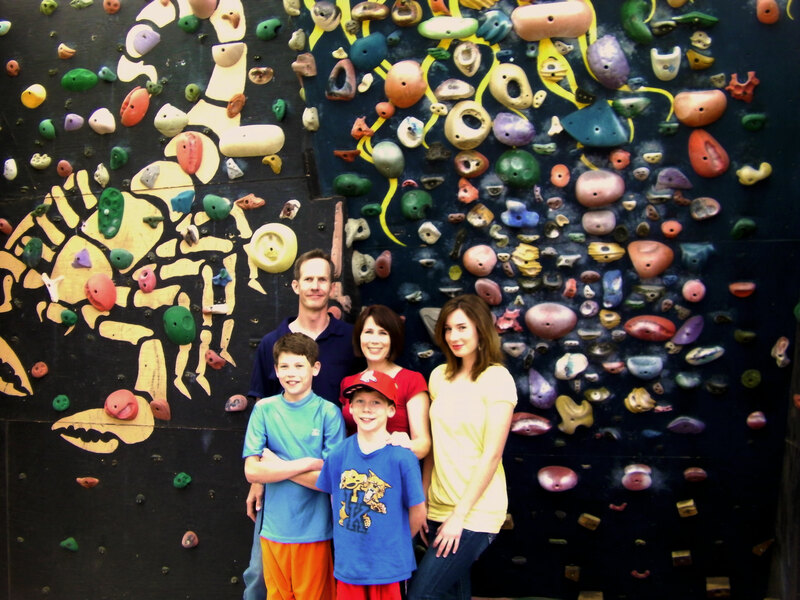 What do you like most about family climbing trips? Rob: Growing closer together as a family and seeing kids learn that hard work paves the way to success. Jen: We have a lot of shared memories and a common identity. I’m seeing the fruit of that upbringing in my teenage daughter. She’s 15 and still likes us! I also love seeing my kids push through their fears and conquer new challenges. Sam: I really like camping and experiencing nature. It’s fun to be out with my family- we all cheer each other on and help each other accomplish our goals. 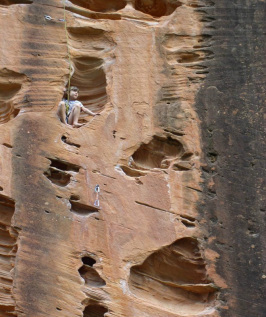 Harry: I like seeing new crags and new climbs, and meeting new people. I like trying to onsight harder than my dad. Preston: Playing outside and meeting new people. (For the kids) What do you want to be when you grow up? Sam: I’d like to write fiction novels. I’m not sure if that dream is practical, but I’m trying to work hard in school to prepare for future opportunities. Someday, I want to be a stay-at-home mom and have a family of my own. Harry: I’d like to fly air ambulance helicopters or go into environmental engineering. 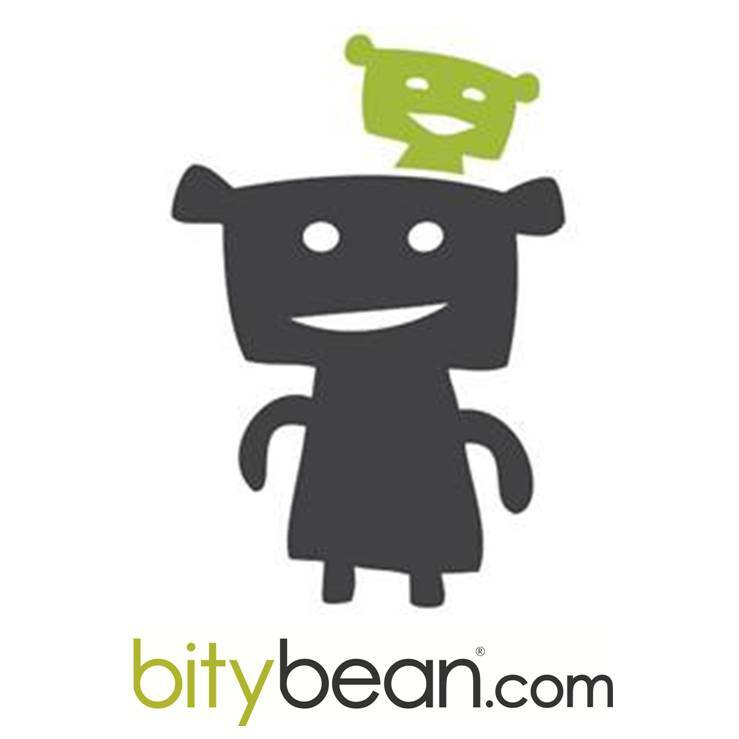 If you could offer one piece of advice to parents/parents-to-be on this subject what would it be? Rob: Cheer kids on and let them cheer you on. Share in adventures together and see what those experiences do to build character and relationships. Jen: In the early years, just hang in there – it gets better! As kids get older, remember how precious and fleeting time is, and take advantage of every opportunity to praise and uplift. Thanks so much to the Edwards family for giving me a glimpse into their lives (and then letting me share it with all of you!) I couldn’t help but notice that every single member of the Edwards family made a reference to cheering another family member on at some point during my interview questions. I think that’s fantastic. While many families don’t even make the time to eat dinner together, this family is sharing life together in such a deep and meaningful way. Is climbing the best way to do that? If it works for your family it might be. But if it doesn’t, take time to find something else that does. My guess is that anything your family pursues together will be a valuable endeavor! If you’re inspired, learned something, or want to share your family’s “together pursuit”, please leave a comment below! Oh yeah, and to follow the Edwards family on their climbing journey, be sure to check out their website here. I’m so glad she mentioned feeling like she was disturbing other climbers peace by bringing the kids. I worry about that constantly! I love these interviews, they give me a sense of where my little brood is heading!